Union Olimpija Ljubljana broke its four-game losing streak by downing Mapooro Cantu 81-79 in Group A in the Slovenian capital on Thursday. Both teams are now tied with 2-5 records, but Olimpija has already beaten Cantu twice. Jaka Blazic paced the winners with 30 points on 4-of-5 three-point shooting. He also hit the go-ahead free throws with 20.4 seconds to go. Dylan Page added 14 while Klemen Prepelic and Aron Baynes each had 13 for Olimpija. Baynes added 10 rebounds for a double-double – his league-leading fifth in six games! 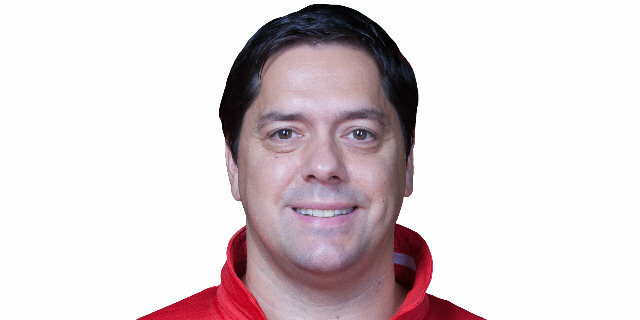 Pietro Aradori led Cantu with 20 points. Manu Markoishvili added 15 and Maarty Leunen 11. A 0-7 run that Nicolas Mazzarino capped with a wild corner triple allowed Cantu to get a 17-22 margin after 10 minutes. Olimpija found a go-to guy in Prepelic, who got some help from Blazic and Drazen Bubnic as Olimpija grabbed a 42-39 halftime edge. Three-point accuracy, defense and an inspired Tyus helped Cantu regain the lead, 59-64, through three quarters. Blazic took over early in the fourth quarter to tie the game, 68-68, and back-to-back triples by Page gave Olimpija a 79-75 edge with two minutes to go. Jeff Brooks and Aradori tied it at 79-79 in the final minute but, Blazic hit free throws and Cantu could not score in the final seconds. Baynes got Olimpija going with a jump hook in the paint, as Cantu struggled to score in the opening two minutes. 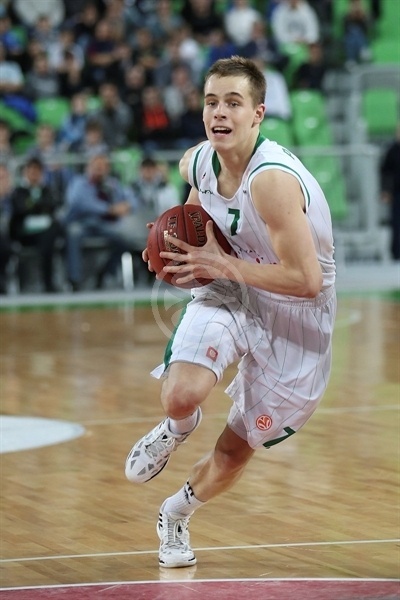 Sasu Salin scored in penetration and a put-back layup by Baynes gave Olimpija a 6-0 lead. Jonathan Tabu struck from downtown and fed Pietro Aradori for a corner jumper that brought Olimpija within 6-5. 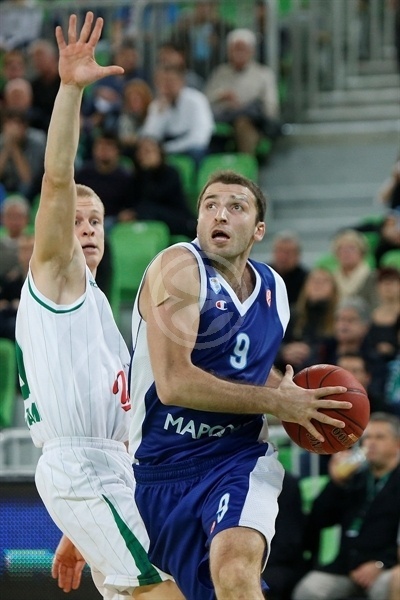 Baynes kept pacing Olimpija with a five-meter jumper, which Markoishvili bettered with a three-pointer. Blazic took over with a wild driving layup, but a three-point play by Marco Cusin gave Cantu its first lead, 10-11. Blazic joined the three-point shootout, but Aradori quickly tied it at 13-13. 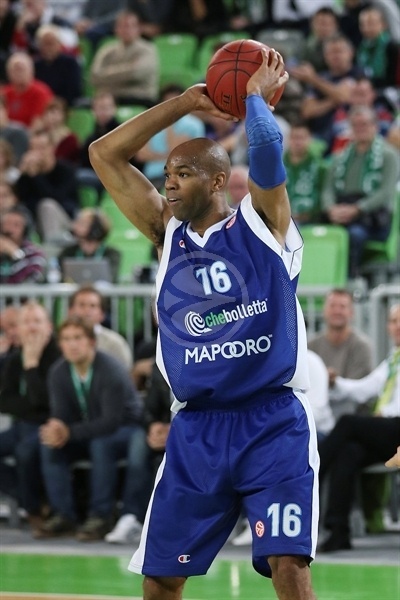 Alex Tyus sank a turnaround jumper that Blazic matched with a dunk. Markoishvili made free throws and Tyus banked in an off-balance shot for a 15-19 Cantu edge. Nicolas Mazzarino capped a 0-7 run with a corner triple, as Blazic stepped up with a driving layup to bring Olimpija within 17-22 after 10 minutes. Blazic split free throws early in the second quarter and followed that with a three-pointer that brought Olimpija within 21-22. Jakub Kudlacek hit 3-of-3 free throws and Tyus erased Alen Omic's layup with a close basket for a 23-27 score. Page shined with a three-point play, but a turnaround jumper by Jeff Brooks gave Cantu some fresh air at 26-29. Prepelic nailed a mid-range shot and Omic tied it at 29-29. Tabu split foul shots and a three-pointer by Prepelic put Olimpija back ahead, 32-30. Markoishvili did not miss from the foul line. Drazen Bubnic matched him with a mid-range jumper. Aradori banked in a tough shot and traded free throws with Bubnic for a 36-35 score. Prepelic made foul shots and soon added a stop-and-pop jumper to boost Olimpija's lead to 40-36. 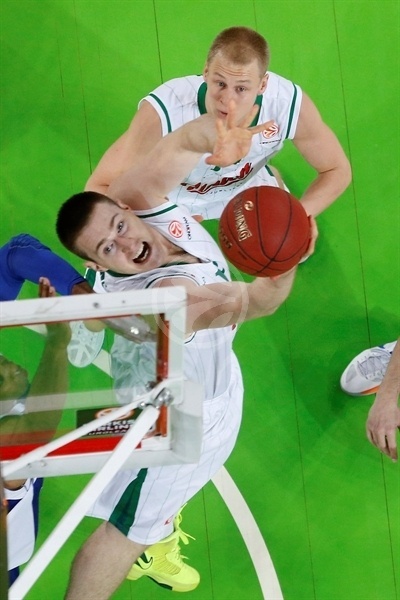 Leunen buried a three-pointer, but Baynes scored around the basket for a 42-39 Olimpija margin at halftime. Markoishvili struck from downtown immediately after the break and soon scored again to put Cantu back ahead, 42-44. Page quickly answered on the other end, but Aradori bettered that with a three-pointer from the left wing. Page sank a catch-and-shoot triple, but Tabu answered with his own show from downtown and Leunen added a jumper to boost the guests' lead to 49-52. Blazic took over with a coast-to-coast layup, but Tabu fed Tyus for a backdoor slam. 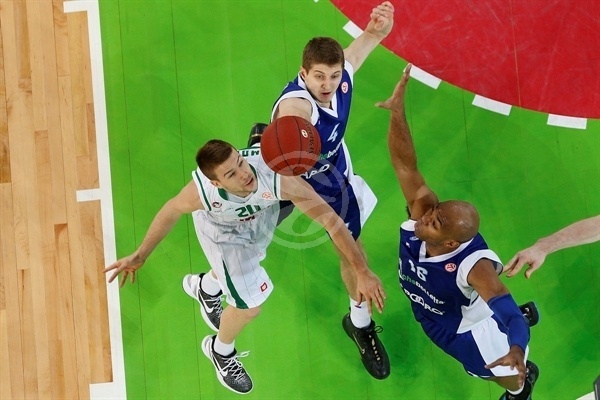 Olimpija struggled to get Baynes involved and Cantu kept running its offense through Tyus. He split free throws, but Blazic bettered that with a three-pointer. Aradori sank an off-balance shot, but Baynes did better with a reverse layup - and the free throw that came with it – for a 57-57 tie. Both teams struggled to score for almost two minutes until Prepelic made free throws. A corner three-pointer by Markoishvili and a backdoor layup by Leunen gave Cantu a 59-64 margin after 30 minutes. Leunen scored in penetration early in the fourth quarter, as Cantu improved its defense right when it mattered. Blazic rescued Olimpija with yet another driving layup, which Mazzarino bettered with a three-pointer for a 61-67 Cantu lead. Blazic insisted with free throws, soon added a three-pointer and scored in transition to tie the game at 68-68 as the crowd roared. Aradori buried a four-meter jumper, but Baynes dunked at the other end. Prepelic hit a baseline jumper before Aradori nailed a long two-pointer to tie it at 72-72. Blazic and Leunen traded free throws and Page buried a critical three-pointer for a 76-73 Olimpija lead. Brooks banked in a close shot only to see Page strike again from downtown to force Cantu to call timeout, 79-75, with under three minutes left. Brooks shined with a jump hook and a put-back basket by Aradori tied it at 79-79 with 33 seconds left. Blazic drew a foul and made free throws to put Olimpija back ahead, 81-79, with 20.4 seconds to go. Cantu had the chance to force overtime, but Tabu and Leunen missed respective shots in the final seconds. "I want to congratulate my boys on a great game. We played on a high level. We played passionately, fighting and unselfishly. This game should be a model of how to play a basketball game from our point of view. Of course, we can't play like this on every game. I want to give props to my assistants who did a great scouting on Cantu. I am happy for my players, because we had a stressful month. I believe we learnt a lot from it. Sometimes you just have to work hard and believe in yourself. We need patience; there is no reason to celebrate after this victory. We have to rest now and prepare for next game. I want to point out that Aron Baynes played this game with back spasms. He took a painkilling injection before the game. His mentality is awesome. I want to say thanks to all the fans that came out and support us." "It is weird, it’s weird to face a game like this. I really don't understand what happened in the last minute and a half. We were guilty on Blazic's defense. We were ahead, but Union Olimpija came back and tied the game. This game could have gone differently. 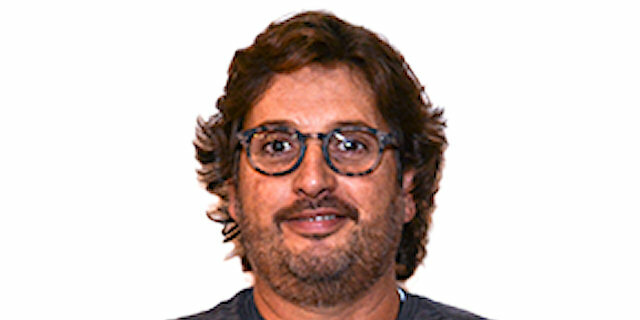 There are two key plays, when Aradori scored on offensive rebound. I believe it was close to an unsportsmanlike foul, and the last play to tie or win the game. I was too far to see it, but I will definitely watch the reply of the game."